There has been a lot of talk about Kevin Trenberth’s “travesty” email. Here is the REAL travesty: Trenberth has selected and presented data in a way that makes the epithet “alarmist” an objective evaluation of his behavior. Kevin Trenberth was a lead author of the 1995, 2001, and 2007 IPCC Scientific Assessment of Climate Change. So, he shares that Nobel Prize with Al Gore. On his day job he is head of the Climate Analysis Section at the National Center for Atmospheric Research (NCAR). One of the hacked Climate Research Unit (CRU) emails that is raising a few eyebrows is from October 12th of this year, from Kevin Trenberth to Micheal Mann (the original shamed author of the Hockey Stick). Trenberth is talking about the cold weather the world has seen lately, and in particular, the cold weather being experienced where he and NCAR reside, in Boulder, Colorado. He says it is a “travesty” that this “lack of warming at the moment” can’t be accounted for. I live just down the road from Boulder, so I know what he is talking about. It has been a cold, snowy, rough fall so far. If you are an anthropogenic global warming skeptic, like I am, then it is dangerous to gloat over cold WEATHER, because it may be warm tomorrow. I do not think unusually cold weather for a season, or even a year, provides a very good counter-argument to global warming alarmism. It goes back to the old weather vs. climate thing. I accept that the recent (say, the last year) cold weather could (almost) be chalked up to weather, not climate. Trenberth's gigantic "future hurricane" next to the real Katrina. Both are on the same size scale. The real travesty with Trenberth has been his long-term take on climate, not weather. Trenberth has loudly trumpeted climate alarmism by preaching hurricane panic. See his Scientific American article from 2007. 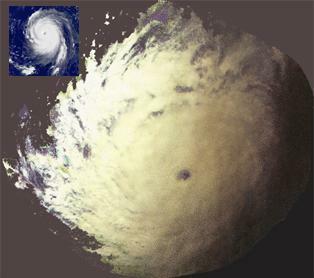 He predicted a trend toward gigantic hurricanes which was depicted by an illustration of a “future hurricane,” which is shown at the left (click to enlarge). An important measure of regional storm activity is the Accumulated Cyclone Energy (ACE) index…The ACE index reflects the collective intensity and duration of tropical storms and hurricanes during a given hurricane season. 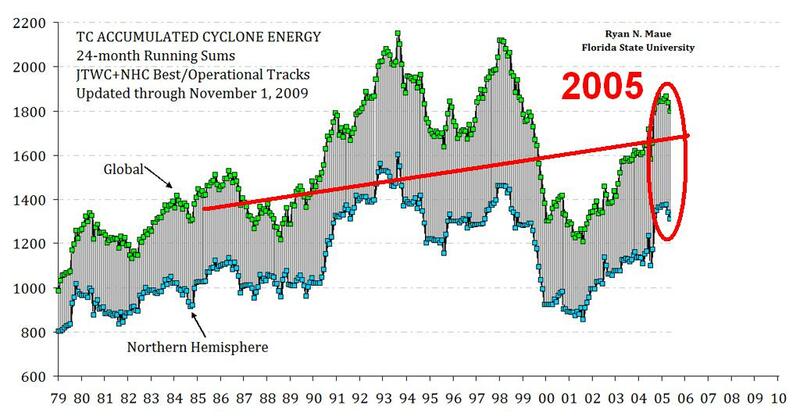 Accumulated Cyclone Energy (ACE) index to 2005. 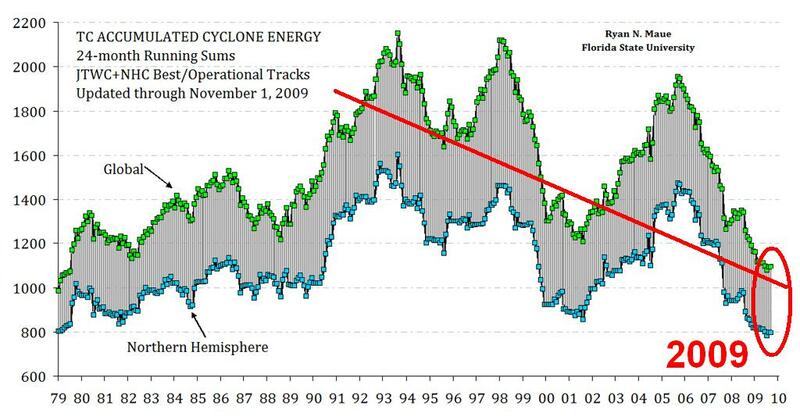 Accumulated Cyclone Energy (ACE) index to 2007. 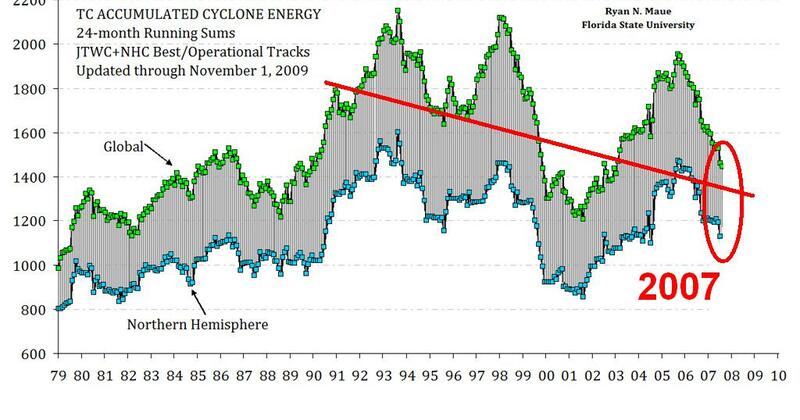 Accumulated Cyclone Energy (ACE) index to 2009. Trenberth and the rest of the gang are willing to sacrifice the tenets of scientific discourse and even common decency , and they are eager to evade the need for transparency, just to maintain their status as the scientific elite. They have selected and presented data in a way that makes the epithet “alarmist” an objective evaluation of their behavior. Trenberth and his cohorts have committed a travesty upon the American people and the world at large. They have cherry-picked the data they have wished to present to the detriment of those scientists who could counter their arguments. Even more obscene is the stance that they have promulgated in order to have our government adopt their theories, which have helped to place industry, jobs and the American economic circumstance in an even more dire downslide. Someone needs to Kevin Trenberth’s ego and nail it to a wall! How does he and his cronies sleep at night? These guys are selling AGW-based policies, and climate science is just a road bump. Trenberth email has been taken out of context of his published work in which he argues clearly that there are important aspects of short term weather fluctuations that we do not understand. He labels it a travesty that we don’t understand in essence as a argument to stimulate more research on the subject. Anyone who finds that email anything that invalidates all the indicators that climate is warming and that humans have a big role in causing that to happen is living a pipe dream. I am wondering if you actually read this post. My guess is you did not. If you did not look at the post concerning Trenberth’s so-called “future hurricanes,” then I recommend you have a look now. You can see it here. Global warming is in effect. All atmospheric extremes are a result of global warming. Of course man has an effect on global warming. To think otherwise is unrealistic. Global warming may have always been a risk in a changing universe. We are seeing the effects of OUR global warming. Expect to be wrong, it’s all new to us. But some hypothesis are undeniable, and all facts are undeniable. Like the melting glaciers, and heat dome over the U.S.
Look at the trend line (line of best fit). It starts out at 1985 in the previous graph. Even AFTER the 2007 one is included, the trendline is still increasing. The other graphs are worse that the first one, because they also obscure the data. Look at where the line starts in those two: 1990! A whole 5 years after the other one. That obscures the line and data. If it started in 1985, like the other one. That line would increase. Obscuring the data… exactly the same thing.